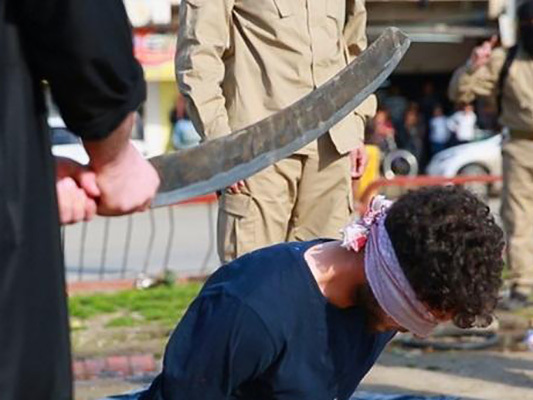 ISIS Beheads Its Swordsmith with His Own Sword! Home World Crisis ISIS Beheads Its Swordsmith with His Own Sword! The man who crafted swords for the ISIS terrorist group was beheaded using the sword he himself had made. According to a Farsi report by Fars News, a local source in Mosul announced that the ISIS terrorists beheaded Abu Hamza Al-Suri, the man who made swords for ISIS elements, on February 13. Al-Sumaria wrote that the ISIS Islamic Sharia Court sentenced this well-known man to death on charges of treason. Abu Yahiya Al-Araqi, the man responsible for ISIS’ chemical bombs, was also killed in suspicious circumstances one day before in western Mosul.